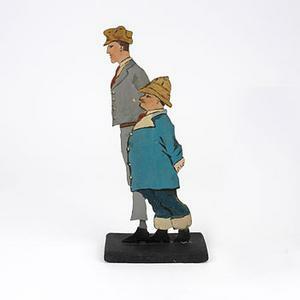 Flat wooden cut-out figure bearing portrait of 'Two Wounded Tommies In Hospital Blues', painted both sides and mounted on wood plinth painted black; one figure is taller and slimmer than the other and wears a grey-blue coloured outfit with red tie and beige cap. The shorter figure is depicted wearing a blue outfit with turned-up trousers and hat, his hands are clasped behind his back and he is smoking a pipe. 'Two Wounded Tommies in Hospital Blues' - painted wooden figures made by wounded servicemen in hospital on Malta in 1919. 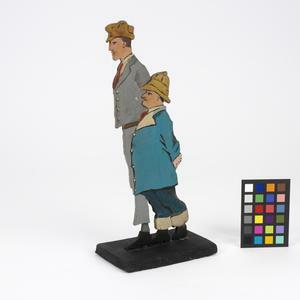 The production of figures of this type (as a form of occupational therapy) may possibly have been related to the pioneering work on 'plychrome figures' by the Liverpool-based sculptor and medallist, E Carter Preston (see EPH 9355 for details).